Recently, I downloaded some data from the FPL website and ingested it into a SQLite database so it could be queried and explored with SQL and potentially exported to other formats such as CSV afterwards. Check out some more sample queries and results. I’ve been working on figuring out the optimal set-and-forget team (Some examples of set-and-forget teams: here, here and here) ex post for the most recent season of Fantasy Football League by formulating the problem as an integer linear optimisation problem, but due to a handful of setbacks I don’t have an answer yet. One of these setbacks was when, after taking 9 hours to solve my model in OR-Tools, I found out that the data I used—and hence the solution I arrived at—was wrong! I had been using the CSV data dumps for each gameweek from Fantasy Overlord, but upon closer inspection, I noticed some issues with the data. 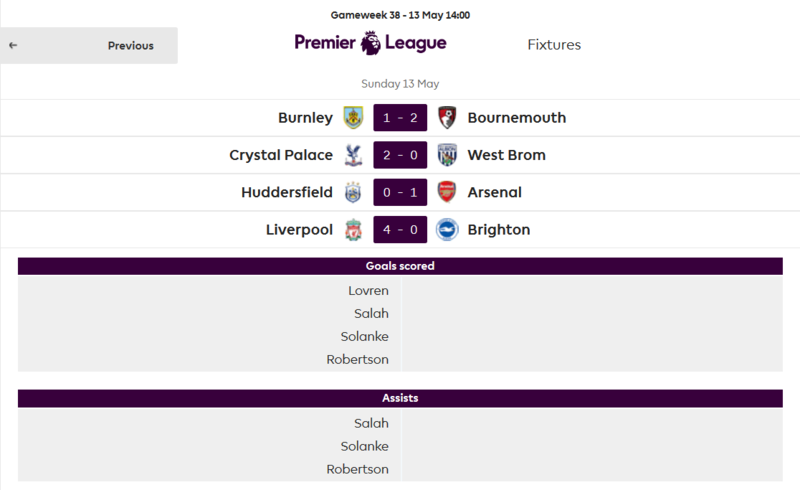 The data for gameweek 37 was the same as the data for gameweek 38—the data for gameweek 38 had been repeated and the actual data for gameweek 37 was missing. I needed a weekly count of minutes played by player, but the data contained a cumulative count of minutes played since gameweek 1, so I had to calculate it myself for each week by taking the difference from the previous week. The values for minutes played played in gameweek 0 were not 0 but instead the total minutes played by each player in the previous season, so my calculated minutes played for gameweek were wrong. This spurred me to put together a dataset myself, in a reproducible way and from an authoritative source of data—the FPL website itself. 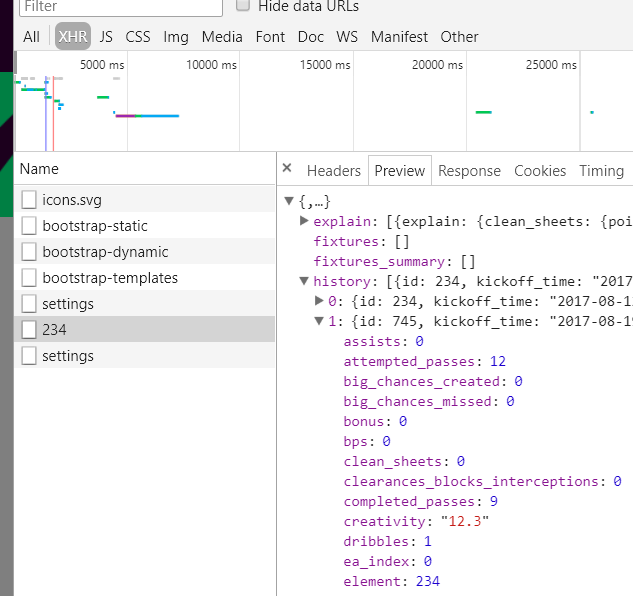 The Fantasy Premier League website is an excellent example of decoupling dynamic data from static page content because of the way it fetches data asynchronously from separate endpoints, compared to traditional server-rendered pages where everything is combined in the server response (although both approaches have their own advantages). 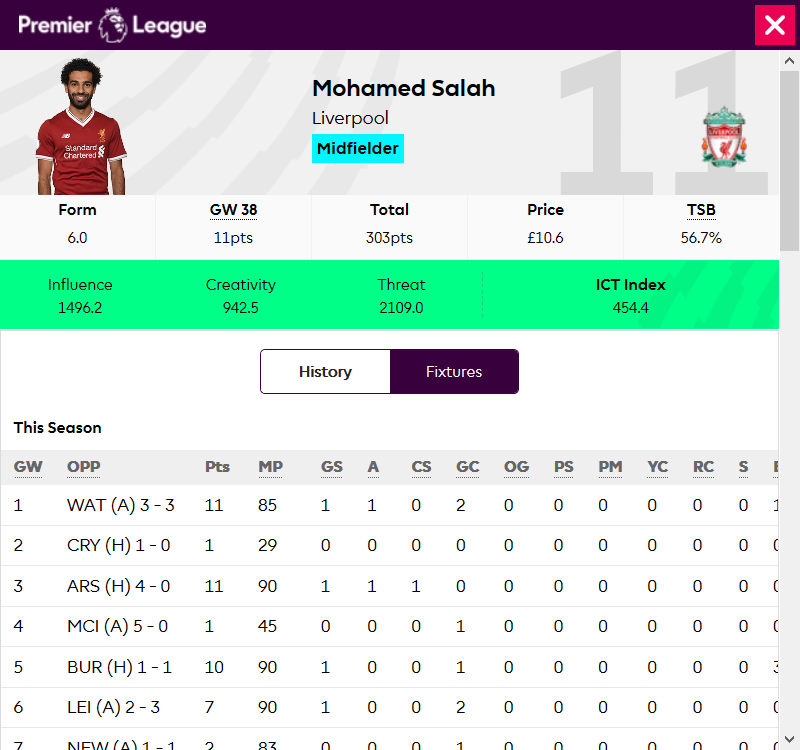 https://fantasy.premierleague.com/drf/bootstrap-static—This is a collection of multiple types of data which, based on the name, is probably to bootstrap the web interface. It contains things like headings, game settings (how points are awarded, how much transfers cost), information for each gameweek (deadlines, average and highest points), and details for each team and every single player. Unlike a similar API used by its parent Premier League website served from https://footballapi.pulselive.com/ which requires requests to include an Origin: https://www.premierleague.com header, the data API used by the FPL website can be accessed directly through your browser. I am going to work on collapsible code blocks for my blog theme next. It would be tedious to create tables with so many columns by hand. Fortunately, the data was well structured—the objects were all flat or mostly flat and attribute values only came in 4 different types (integer, real, string and boolean)—so the table creation could be automated. I used modified versions of the above functions to exclude certain attributes containing redundant denormalised data in the form of nested objects which could not be easily mapped to columns, and also to specify additional constraints for columns such as primary and foreign key constraints where applicable. Later on, I also realised that certain attributes in the data are quite volatile—specifically the value related attributes on player objects: value_form, form and ep_this—when I was trying to reproduce my dataset and the generated SQLite database was slightly different, discovering the useful sqldiff.exe tool in the process. Perhaps these attributes should be excluded from the dataset as well in future?